Find out more about outdoor kitchen barbecue islands – a massive growth sector of the barbecue market. This guide will help you understand what they are, how much they cost and whether it's possible to make one yourself. What Is A BBQ Island? Constructed out of modular steel it is effectively an outdoor work top similar to what you have in your kitchen. Imagine your fitted kitchen with a granite worktop, built in oven and hob, sink and drawer units, well take that and drop it outside as a free standing unit on your patio and I hope that you’ve got the idea. It’s a barbecue grill of course, not an oven and hob but the rest is pretty similar. 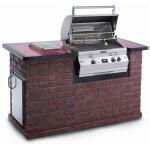 With modern outdoor kitchen barbecue islands you can really go as far as you like. From a humble worktop with built in BBQ right up to those with built in sinks, ice boxes cupboards and drawers and when you’ve got some patio furniture too you almost have an extra room in the house. In fact I read somewhere that after the kitchen and bathroom, the room where the average American family spend most money is the outdoor kitchen! BBQ Islands are really popular in America and the trend is now coming across to Europe. I’ll be doing an extension to my house next year and part of the plan will be to develop my outdoor kitchen so as I do my research there’ll be more information coming in this section of my site. How Much Does A BBQ Island Cost? Well it really is a case of how much do you want to spend. The basic island including grill, granite worktop and a cupboard under will probably set you back about $3000 and you can go on and on. If you want to spend $10,000 to get something special with all the accessories that you could possible need then it’s perfectly possible to do so. Of course you don’t have to spend all at once, with some manufacturers you can buy the basic kit and then build on as and when finances permit. Remember, BBQ islands are built for the outdoors so they’ll certainly last forever and a day. Where Can You Buy Your Barbecue Island?
. They sell Fire Magic, Cal Spas, PES amongst others and they guarantee that their prices will not be beaten. There's also now a special breed of contractor that specializes in installing outdoor kitchen barbecue islands. Can You Build Your Own Barbecue Island? Yes, if DIY is your thing then it’s perfectly possible and a great low cost option, so where to start? There’s a lot to think about when building so I would always recommend doing as much research, planning and preparation as possible before starting.